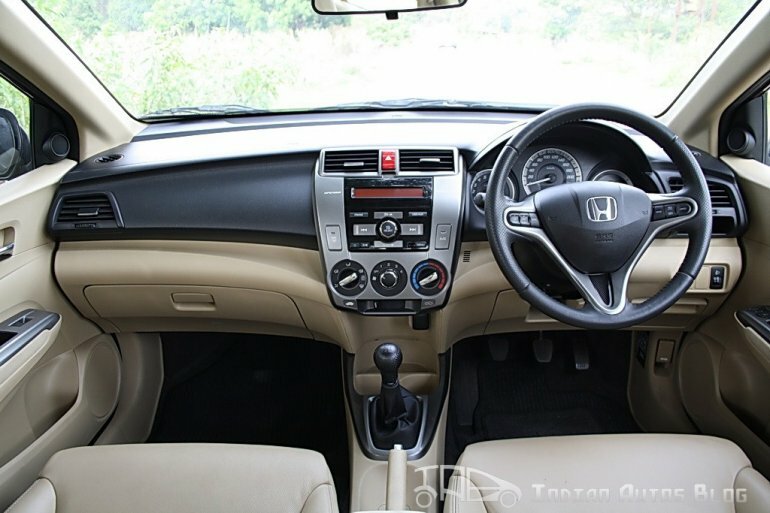 During the press conference of the launch of the new Honda City, the Japanese automaker stressed on the localization efforts on the interiors of the car. 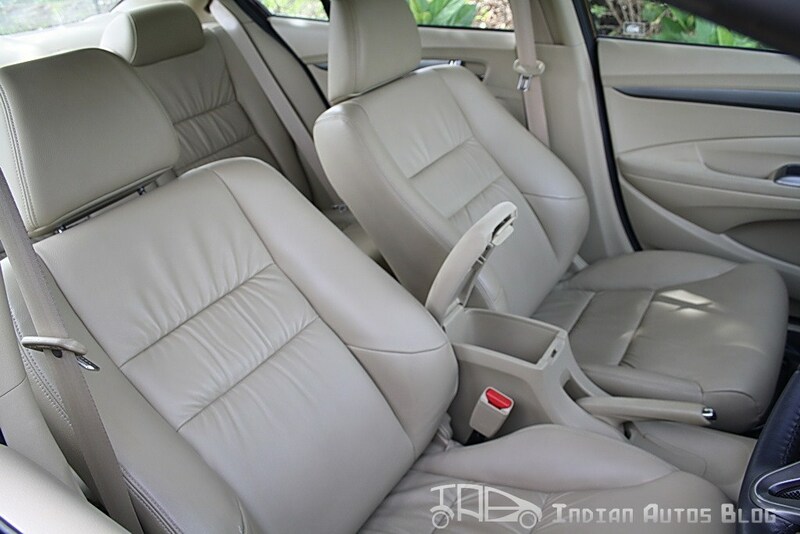 Back in the day when Skoda and Toyota stressed on their localization efforts of Fabia and Liva, they compromised on the quality feel of the interiors. 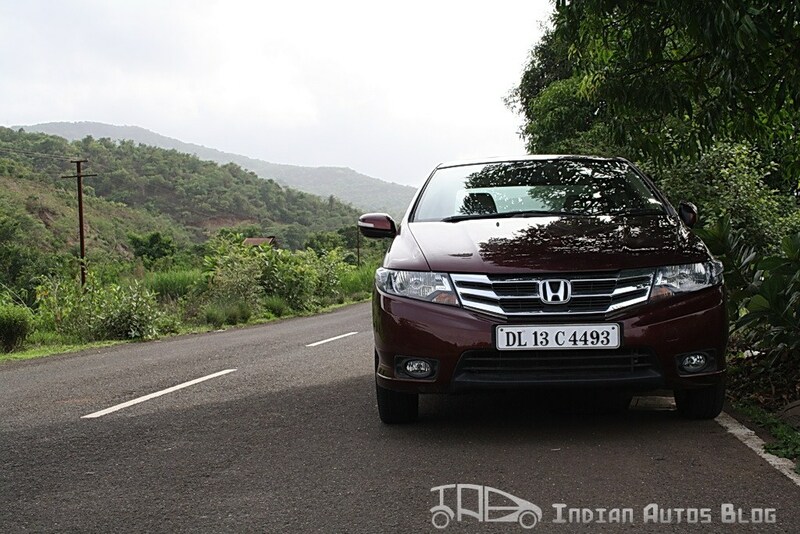 So has Honda India repeated the same mistake with the new City? Step inside the City and you will notice that that nothing much has changed in the facelift. 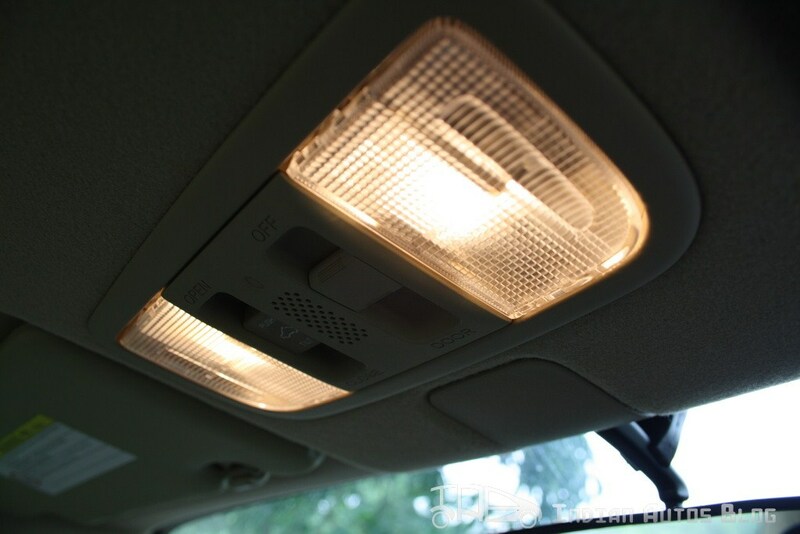 It is a dual tone interior – a combination of light beige and black. The light beige gives an airy feel to the cabin. Ingress and egress is very easy because of the low floor. 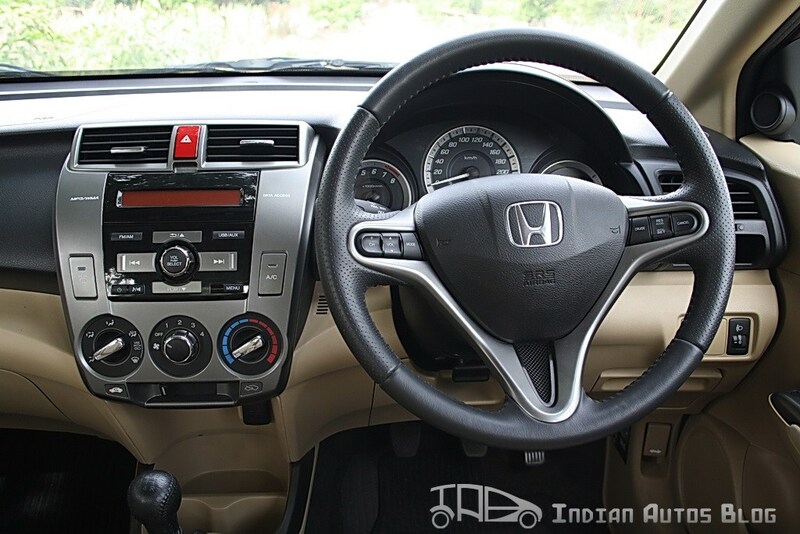 Once in, you notice the Honda Civic style steering wheel. The steering does not have thumb pads like the one in the Fiesta or Linea but still the grip of the steering wheel is good. It can be adjusted for height but not for reach. It gets steering mounted controls that helps you shuffle soundtracks and set the cruise control – a new feature added to the 2012 model. 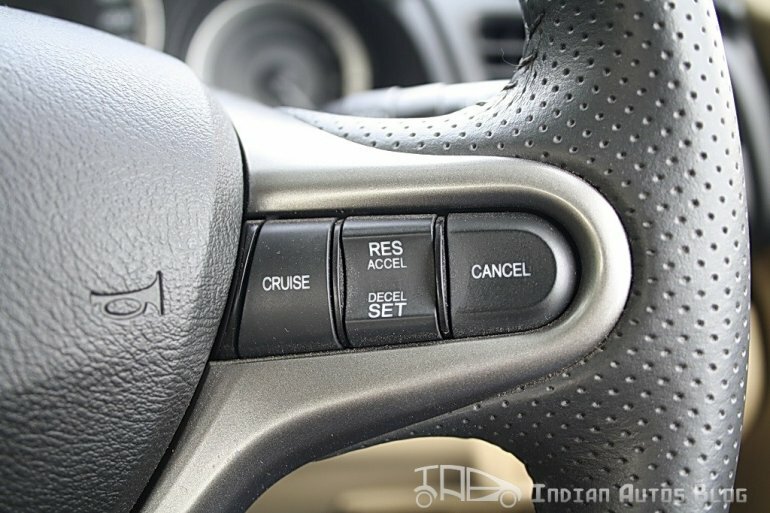 The usability of the cruise control in India is definitely debatable. 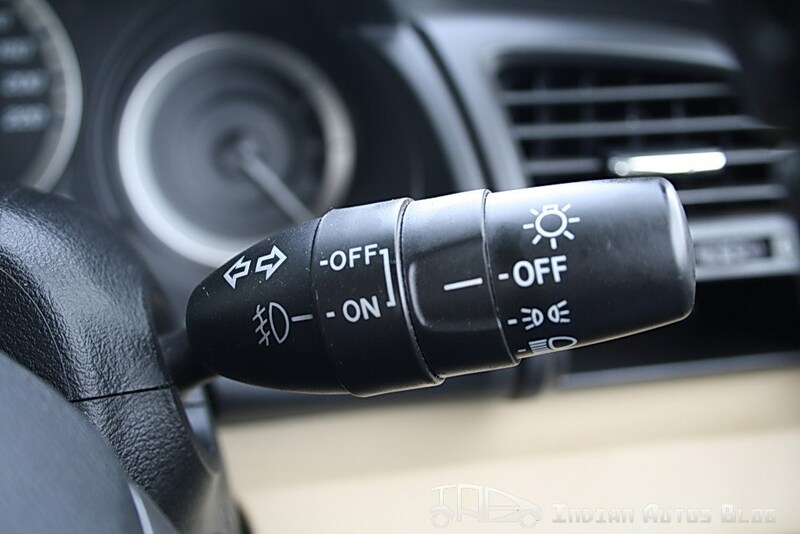 The indicator and wiper stalks are on the ‘right’ side of steering wheel. 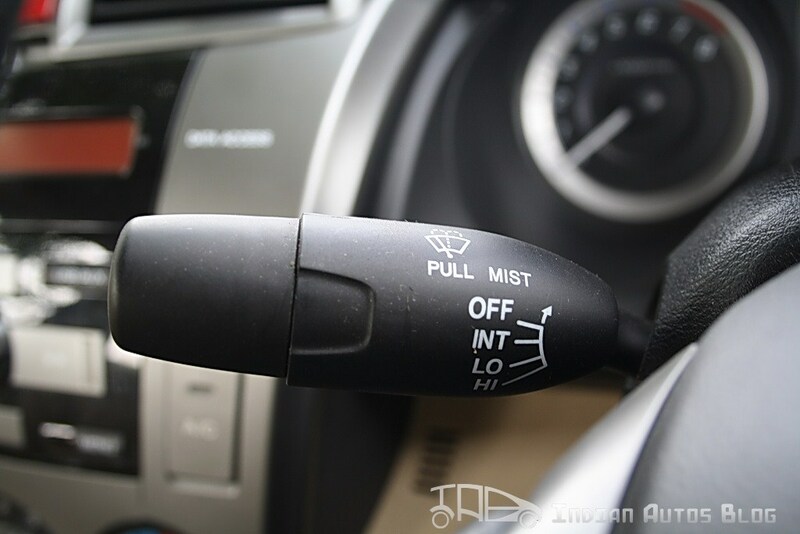 If you buy the automatic variant, you will also get paddle shifters. The dial cluster has an illuminated blue backlight. 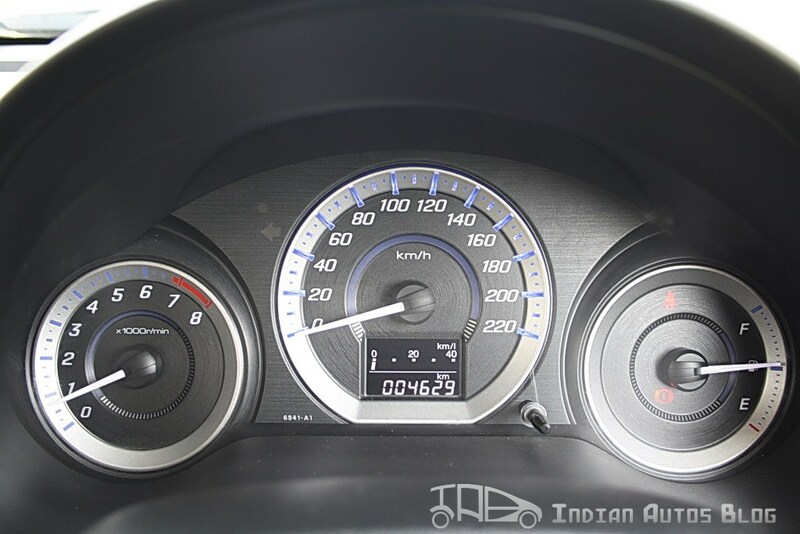 The new City also gets a our favorite ‘ECO’ meter which debuted in the Brio. 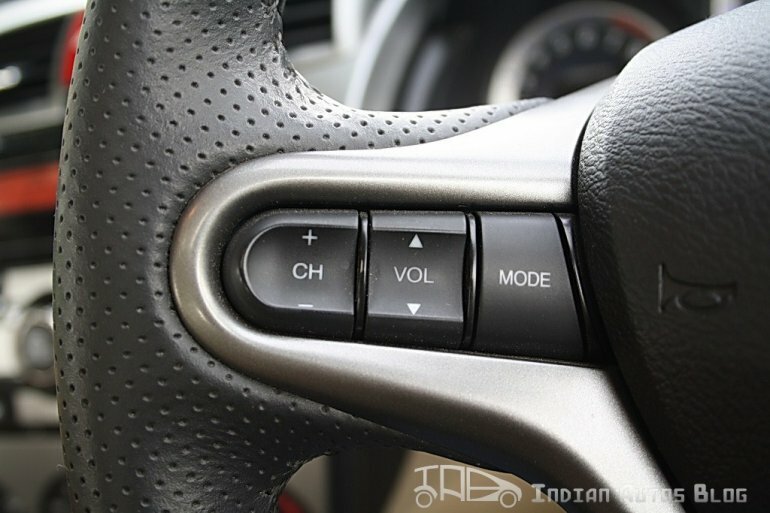 Essentially, it is a green light in the dial cluster which turns on when you are driving economically. 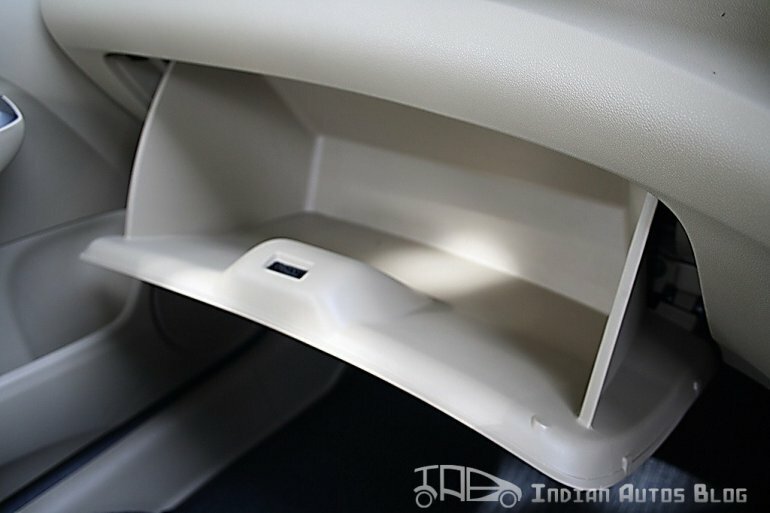 I am very disappointed with the center console of the Honda City. It just does not gel well with the overall dashboard. 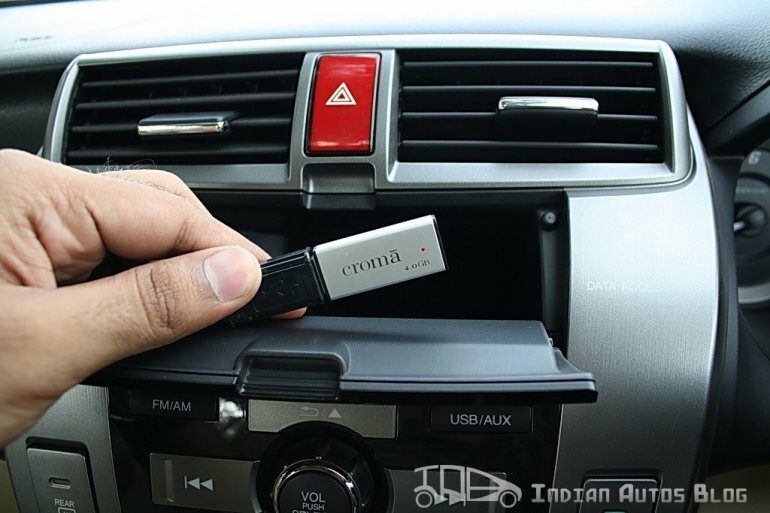 The center console comes with an integrated audio system that has an USB/MP3/AUX/radio player. I like the bold move of Honda of not providing a CD player. When was the last time you went out and bought a CD?. But if you want a CD player, that’s an optional extra. Sound quality is excellent. 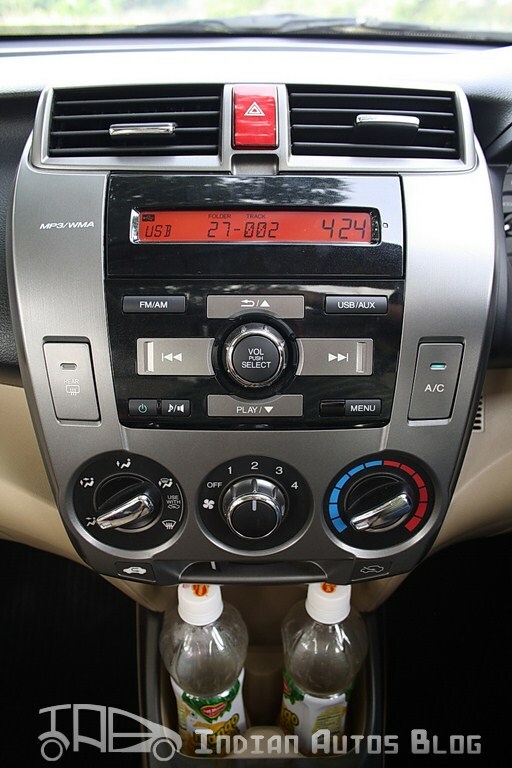 Traditional AC knobs find their place below the CD player. Cooling from the HVAC is top notch. 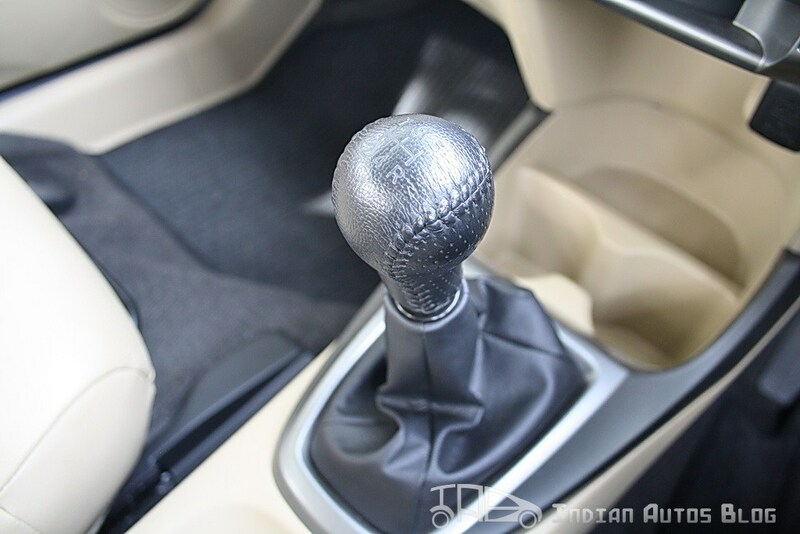 The gearstick is now leather wrapped instead of the golf ball top. The leather stitching on the gearstick is not consistent giving it a cheap feeling. The glove box is adequately deep but not chilled like on the Toyota Etios. There is a second compartment on the driver side to store some spare coins. 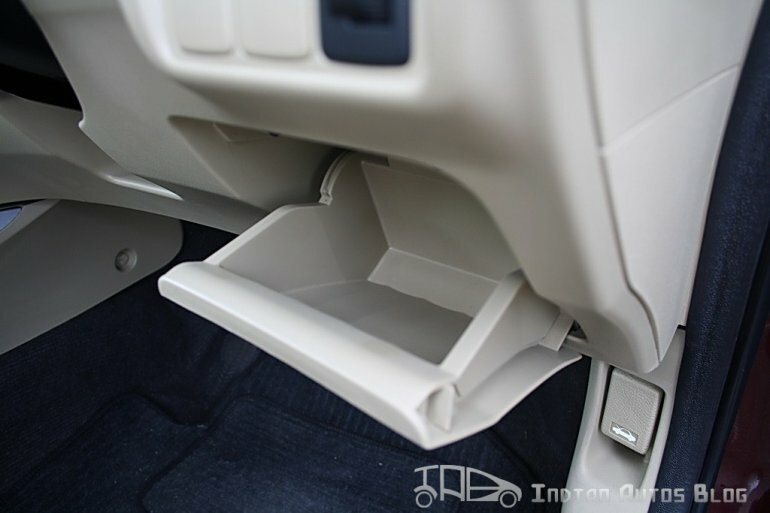 For practicality, there’s lots of storage space with generous door pockets, cubbyholes and cupholders. There are no sunglasses holder on the top because there are sunroof controls. 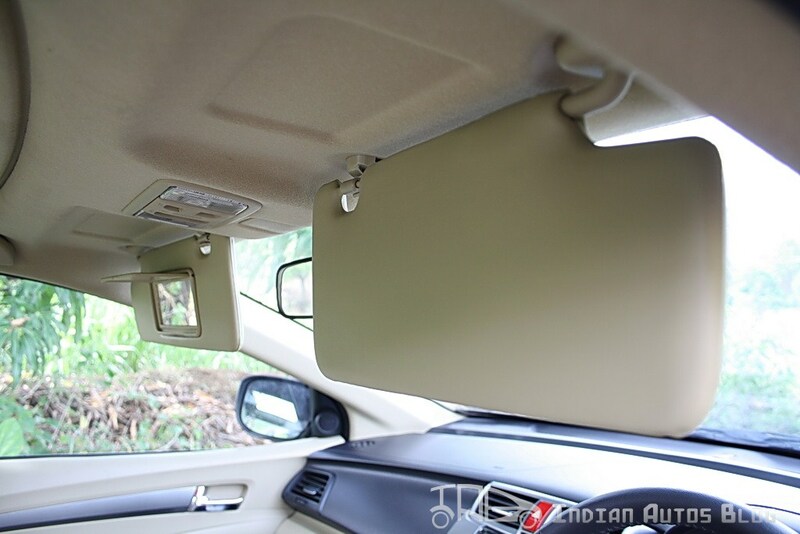 The vanity mirror is only given to the passenger. 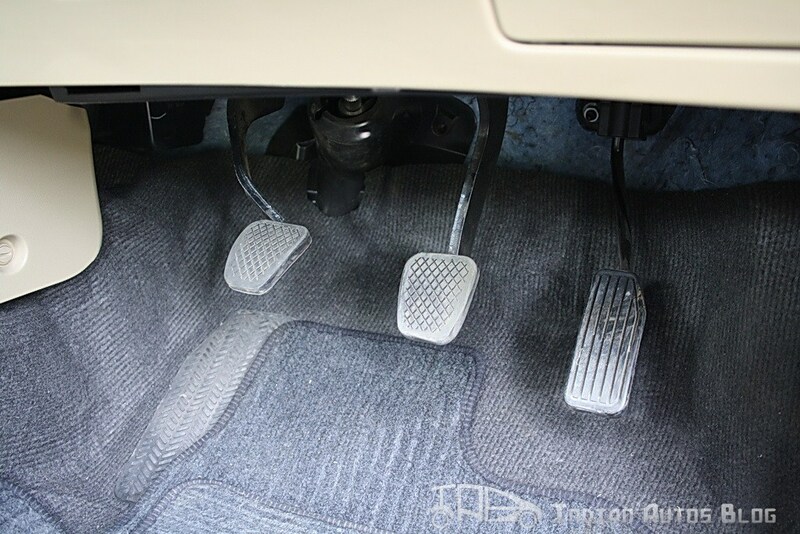 The pedals are widely spaced out but there is no dead pedal for long distance comfort. The seats are leather wrapped and the fit and finish is top notch. 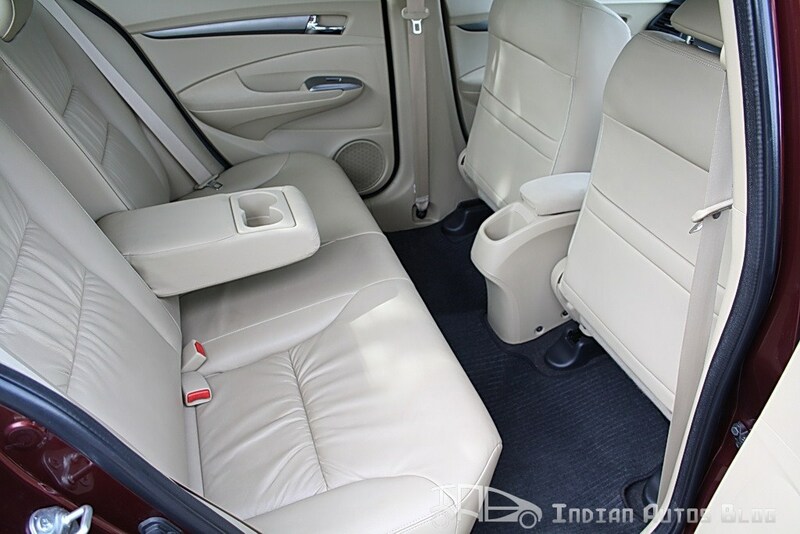 The seats are very comfortable and hold you very tightly when cornering aggressively. 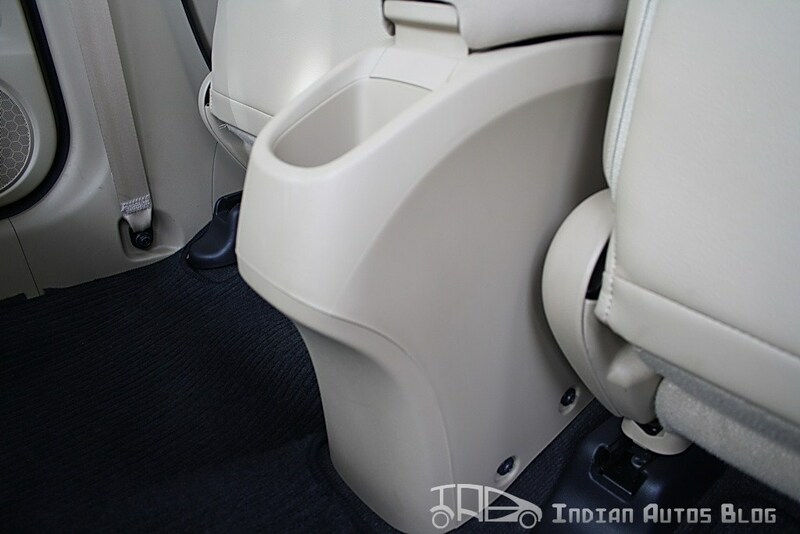 The front passengers get a center armrest which is also a storage compartment. 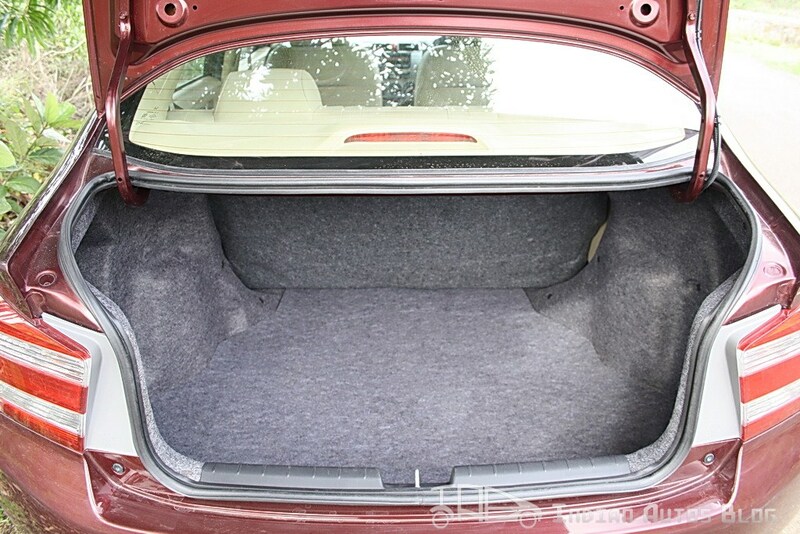 The bootspace is adequately big with 506 liters of loading space, but the loading bay is pretty high above the ground. When sunlight hits the windshield there is too much glare. There are certain parts of the interior which are covered by a velvet like material. It may get dirty after prolonged usage. The center console only provides real time fuel economy. Average fuel economy figures are nowhere to be found. This is disappointing considering even the less expensive Brio has it. The rear seats do not get dedicated AC vents. Honda should consider this feature on the next gen City. The high boot line makes parking a bit tricky at times. Parking sensors are a must. Lack of climate control in the entire lineup. The Honda City’s interior quality, build quality, fit and finish are remarkable. The sound insulation is perfect; no outside noises infiltrate the cabin on average speeds. However, lack of certain important options is discerning. We would like more features to be added to the City’s lineup because rivals like Fiesta and Verna bring so much extra to the table. Stay tuned for the driving review.